We just received our copy of the April 22, 2011 issue of Sports Collectors Digest and, although it features our article about Sports Illustrated magazine, Dean found one article that he may have enjoyed even more. 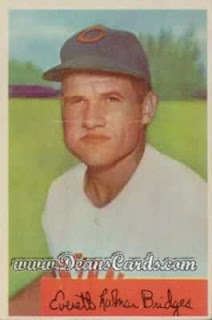 The Baseball Art column, by Ronnie Joyner, discussed Rocky Bridges' long playing career and included numerous quotes about playing in the major leagues. Dean's personal favorite Rocky Bridges quote, which he read aloud to the entire office today, is "There are three things the average man thinks he can do better than everybody else -- build a fire, run a hotel, and manage a baseball team." This is definitely one of our favorite baseball player quotes ever and we're hoping for more gems like this from SCD. While he was the manager of the AAA Phoenix Giants, Rocky was quoted as saying, "I can't spell Albuquerque, but I can sure smell it."